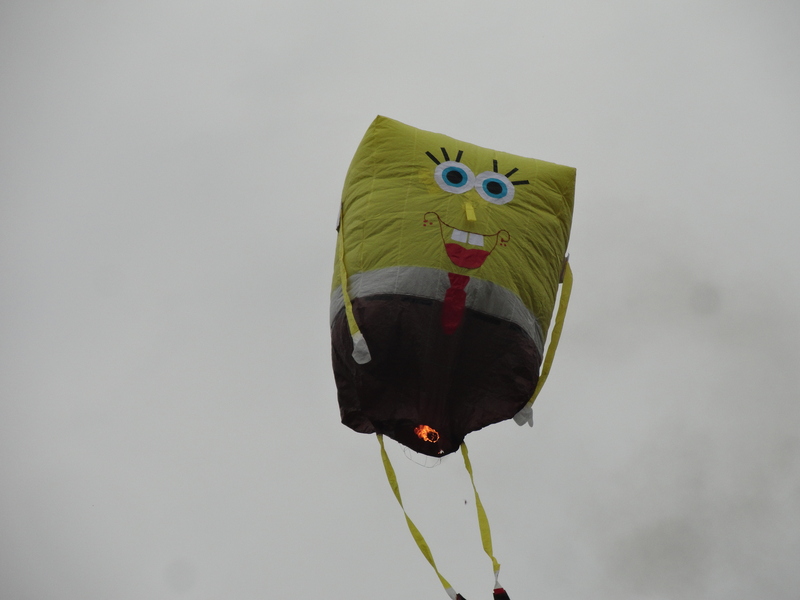 If a picture is worth a thousand words, credit me with six thousand in my six- photo depiction of the word, “Mustard.” Before his early demise, Sponge Bob was a fifteen foot (or more) high hot air balloon made from Tyvec, constructed in Mexico as one of hundreds launched in a yearly Independencia celebration in Ajijic. 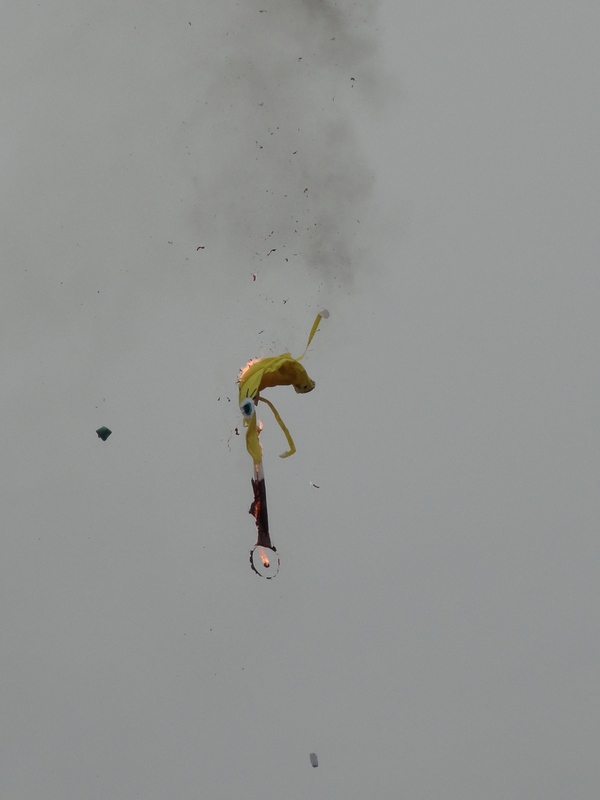 These balloons take months to design and construct, then up to a half hour to launch, as a crowd of a thousand or more mills around on the ground or sits patiently in the stands of the soccer field, waiting for their ascent. Usually three or four are being launched at any given time throughout the long afternoon and evening. First a fire is lit in braziers to create the hot air to fill the balloon. 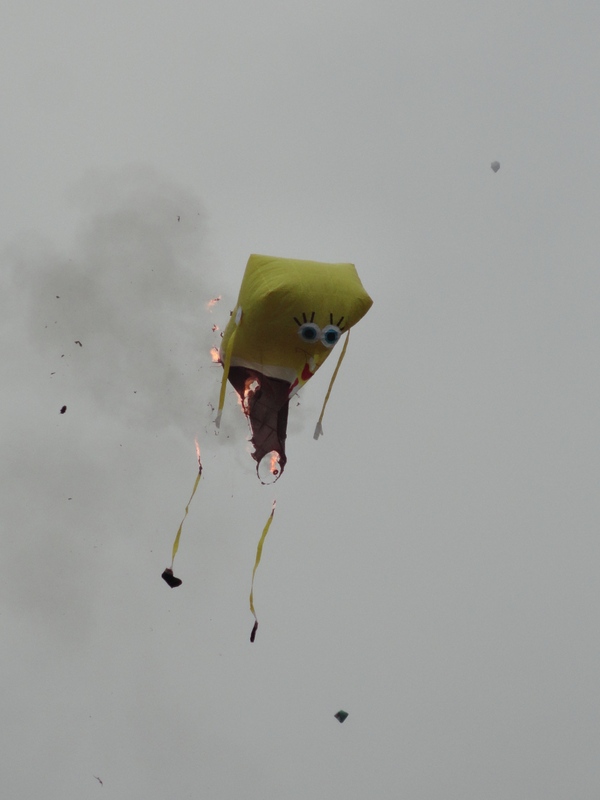 Then a ring in the center of the bottom of the balloon wrapped in kerosene or gasoline is set fire to keep the balloon inflated and the balloon rises above the heads of the crowds, sometimes floating away to nearby towns, at other times meeting within minutes or even seconds with the fate of Sponge Bob Hotpants. 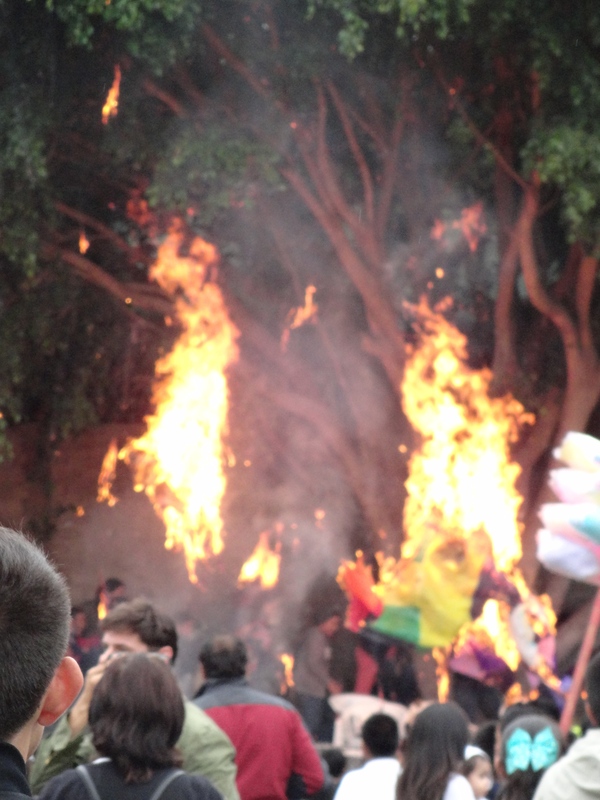 The spectacle of the remains of the burning balloon falling into the crowd or trees or rooftops or highline wires is taken with a fatalism endemic to Mexico. Small boys rush to stomp out the remains of the fire. No mothers scold. No fathers forbid. The crowd pays more attention to food purchased from local vendors than they do with the possibility of being set on fire. This is Mexico. Such things just work out one way or another. A nearby firetruck was never called upon in the time I witnessed the event. 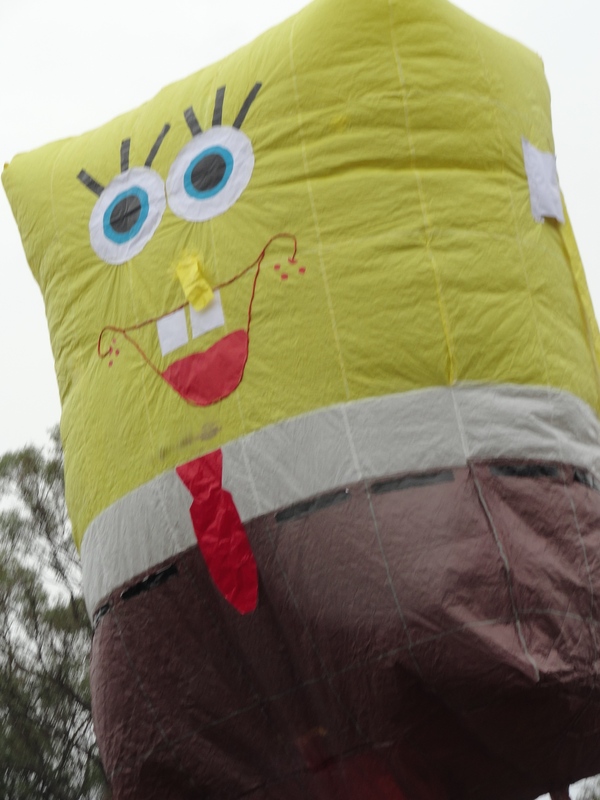 Sponge Bob, the most mustard of balloons launched and an annual crowd favorite, was soon history and the only mustard to be seen was on the amazing spiral-cut hot dogs-on-a-stick served in one of the food stands that rimmed the road leading into the soccer field. 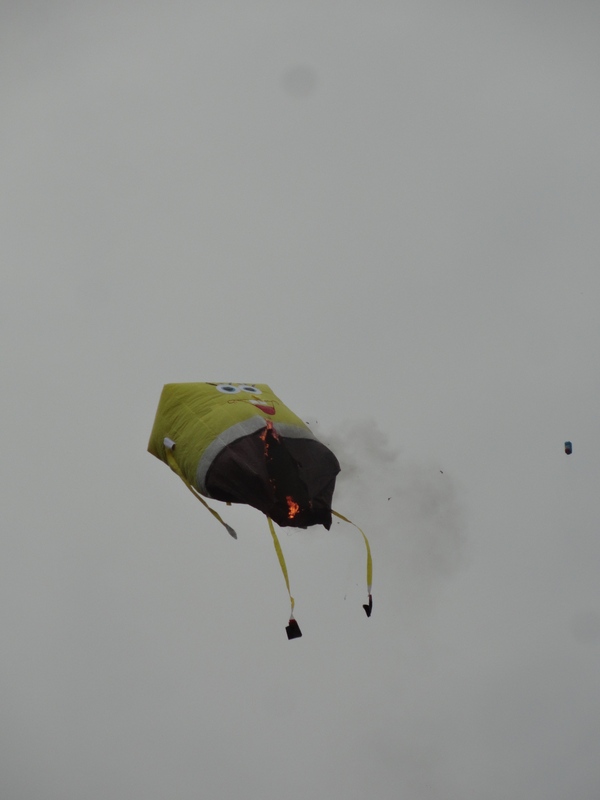 This entry was posted in Food, Hot Air Balloons, Mexican Independencia, Mustard, photographs, photos on September 23, 2014 by lifelessons.